Saks Fifth Avenue will debut the new main floor of its flagship New York City store this week, marking a major milestone in its $250 million renovation project. Hudson’s Bay Co.’s 41 Saks stores have been one of the few bright stars for the struggling retailer, which over the past year sold the e-commerce site Gilt, merged European operations with a rival and closed some Lord & Taylor stores. Comparable-store sales at Saks rose for the past six consecutive quarters. Handbags will be the most prominent items at Saks, which has added 15 more fashion labels to its accessories lineup, including Celine, Bottega Veneta and The Row. The remodeled main floor is about 53,000 square feet—about the size of a Whole Foods—and will be staffed by 50 handbag style advisors in addition to the store associates that sell each brand. Manhattan is becoming a department store battleground this year. In January, Saks closed its experimental women’s store just two years after it opened. Both Lord & Taylor and Henri Bendel that same month closed their Fifth Avenue stores, which had each been open for more than a century. Meanwhile, luxury rivals Neiman Marcus and Nordstrom are set to open flagships in the city in the next few months. “I’m so thankful they both decided to come to Manhattan,” said Metrick of the competition “because it gave me license to spend a quarter of a billion dollars on our store.” Saks began the overhaul in 2015, refreshing three levels devoted to women’s designer labels. Men’s shoes and a high end jewelry section in the basement called “The Vault” are next. Metrick expects to complete the project in 2021. The escalator leads to the new beauty floor. Last year Saks broke with decades of tradition by moving its beauty section to the second floor, growing its size by 40 percent and offering high-end services such as face workouts and slimming massages. Stores typically keep cosmetics on the ground level to drive traffic. Saks plans to make similar design changes—especially in the beauty section—in others stores, including Miami, Houston, Toronto and Beverly Hills. The retailer won’t necessarily relocating its other beauty floors, but will instead tweak existing spaces to optimize services, lines of sight and lighting. 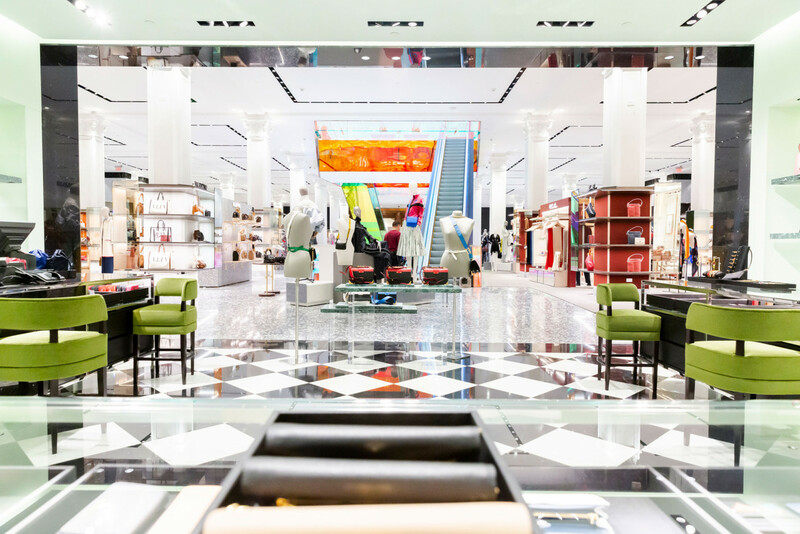 Metrick hopes the renovation will put Saks on par with Europe’s palaces of luxury consumption, such as Harrods, Selfridges, Bon Marche, Printemps and Galeries Lafayette. America’s department stores historically lacked that level of extravagance, he said.